Nadezhda Kevorkova has worked at RT since 2010, before which she was a special correspondent for ‘Novaya gazeta,’ ‘Nezavisimaya gazeta,’ and ‘Gazeta.’ Kevorkova has also worked extensively in Russian mass-media. As a war correspondent, she covered the Arab Spring, military and religious conflicts, and the anti-globalization movement. She has worked as a reporter in Egypt, Sudan, Palestine, Jordan, Lebanon, Syria, Iraq, Iran, Pakistan, Azerbaijan, Ukraine, Hungary, Greece, Turkey, Cuba, and in the republics of the North Caucasus, Tatarstan, and in the Far East. In 2001, after an invitation from US State Department, Kevorkova visited a number of states, including Alaska. As a correspondent of 'Gazeta' she reported from Indian settlements in the US. She covered the ‘Gaza Freedom Flotilla’ in 2008, 2010 and 2011; she also visited Gaza several times during the blockade. 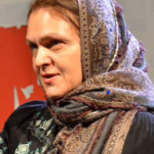 In 2010, Kevorkova was nominated for the ‘International Women of Courage’ award. 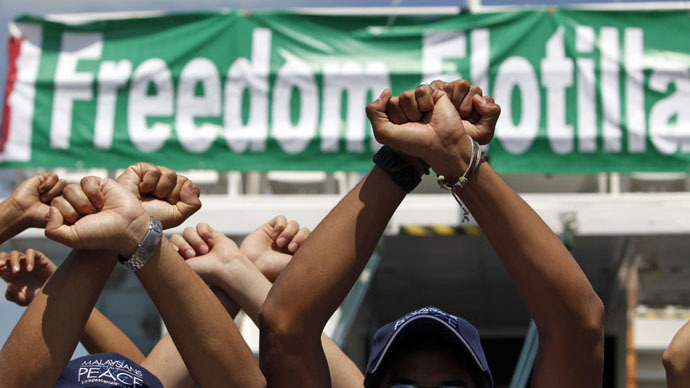 The Marianne and three other boats carrying 50 people have begun their voyage to Gaza, Freedom Flotilla (FF) announced in a press release. A fifth boat had to return because an activist got sick. The boats are moving towards Gaza. The Marianne expects to arrive in Gaza’s port by Monday morning, while the three other boats are making headway very slowly. On Thursday, a helicopter hovered over the boat. Crete’s coast guard took every opportunity to hamper the flotilla and turned back a fishing boat trying to bring more people to the Marianne. On Friday, a military plane flew over the Marianne. Its country of origin was not clear but it was flying low and slowed down to follow the Marianne for some time. Despite the impediments, that evening, the Marianne swapped garbage for new passengers – a nice headline for those who follow the flotilla’s news. In the dead of night, the Marianne welcomed Moncef Marzouki, president of Tunisia 2012-2014; Dr Bassel Ghattas, an Israeli MP of Palestinian origin; Ohad Hemo, an Israeli journalist; as well as an Al-Jazeera TV crew. It also picked up new supplies of freshwater and food and dropped off bags of garbage which had accumulated over the six days of waiting. This is the first time an Israeli TV journalist is on the FF. Ohad Hemo has managed to make several live broadcasts, in which he stressed that there were only peaceful activists on the Marianne, that they possessed no weapons, and that these activists were in no way associated with Hamas or Fatah or any other groups. Dr Bassel, who is an MP in the Israeli Knesset and an Orthodox Christian, says the flotilla is a legal peaceful act that does not undermine Israel’s security in any way. Moncef Marzouki wanted to take part in the Freedom Flotilla because he has been a human rights campaigner for a long time, and considers the blockade of Gaza a gross violation of human rights. Ex-MEP Anna Miranda also regards the FF as an absolutely legal and fair cause. She also stresses that the FF has no ties with groups in Palestine and supports ties with NGOs. It is forbidden to arrest a president (even a former one) or an MP, or to search their belongings. It would also be a violation of law to capture the ship in international waters. But the Israeli media have dubbed the FF as ‘Mavi Marmara 2’ and seem to be waiting for its seizure. Several TV crews from Israel requested a place on board but unfortunately there wasn’t enough space for them all. IDF troops have video cameras, so if the ship is stormed, Israeli TV would get footage anyway, unless the army bans it. VIPs and journalists from different countries also sought a place on the boat at the last minute. It seems that this picture of a boat attempting to breach the blockade has become politically trendy. The current marine minister of Greece, for example, was a member of the flotilla in 2008. Some FF activists have received death threats but remain defiant. Many of the activists are getting reports that Gaza is waiting for the flotilla with bated breath and following its every move. It’s true that small boats like this can’t really render any significant aid to the blocked territory. However, people in Gaza and around the world, in Israel and the European Parliament, as well as the media, realize that its main mission is to break the 8-year blockade. The siege of Leningrad last almost 900 days during WWII. It’s hard to image that the USSR’s allies – the governments of the US or UK – or the press in those countries would have considered the siege of Leningrad to be legal or acceptable. Many governments and the UN have recognized Palestine, but they have been reluctant to help Gaza in lifting the blockade. I know of only two similar historical examples of such a long-standing blockade: the 10 year siege of Troy by the Greeks 3,000 ago, and the siege of the Solovetsky monastery by the troops of the Russian tsar in the 17th century. It’s not quite clear which example inspires the Israeli government more.